Communities throughout Indonesia are losing land to companies seeking to profit from the booming palm oil industry. “Each year, more people are fighting palm oil companies to hold on to their land,” said Gefri Saragih, campaign department head of Sawit Watch, a local NGO monitoring palm oil cultivation. Since 2006, 632 communities have clashed with palm oil operators, the group reported, mostly because of a lack of community consultation, required as part of a project’s environmental impact assessment. On 8 June, police opened fire on hundreds of farmers rallying in Riau Province on Sumatra Island, killing one woman and leaving one man with head injuries, local media reported. The farmers claimed that Tri Bakti Sarimas, a palm oil plantation operator, had broken a profit-sharing agreement signed with the communities in 1997. Others accused the company of overstaying its concession, claiming it expired in 2002. Under Indonesian law, the government owns all the forests and can grant decades-long land concessions to a community or private enterprise. 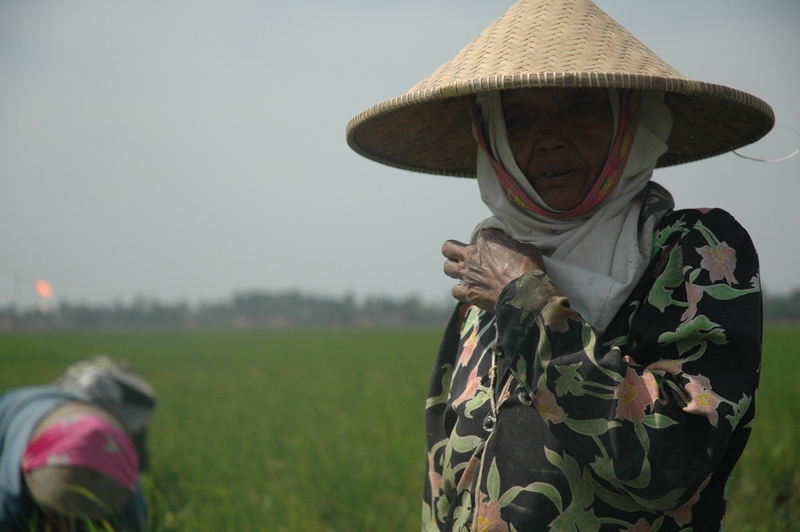 Tonih, 80, has worked the same paddy for seven decades in Bekasi, on the outskirts of Jakarta. More than 50 million Indonesians depend on the forests for their livelihoods, and many are fighting to earn 35-year community concessions to keep companies off their land. Palm oil is found in about 50 percent of the world’s packaged supermarket products, including shampoo, biscuits and detergent, according to the World Bank, and small-scale rice and vegetable farmers have been encouraged to convert their land to grow the cash crop. Indonesia’s US$15 billion stake in the industry gives it almost 50 percent of the global market. India and China alone imported more than 13 million metric tonnes of palm oil last year, mostly from Indonesia, which produced 20 million metric tonnes in 2009, according to the Indonesian Trade Ministry. Environmental groups now hope a two-year suspension on new concessions, slated to begin in 2011 under a $1 billion deal with Norway, will slow land conversion. Indonesia also has obligations to its indigenous groups, often the most vulnerable to land- and resource-grabbing. This year, 22 indigenous people have been arrested for taking resources such as wood from land they have traditionally used but has since been licensed to palm oil operators, according to Sawit Watch. “When the palm oil and paper companies came in, they offered us little things,” said Temengung Ngamal, an indigenous Orang Rimba, who lives on the outskirts of the Bukit Tigapuluh National Park in Jambi province, Sumatra. Since then, Temengung and his family have received nothing from the palm oil operators or from paper company Wira Karya Sakti – a subsidiary of paper giant Sinar Mas – which holds a concession to log the area. Under the UN Declaration of the Rights of Indigenous People (UNDRIP), which Indonesia signed in 2007, companies must have the “free, informed and prior consent” of indigenous groups before operating on land they live on or regularly use. UNDRIP also states that indigenous people should be compensated for all the resources taken from them and that the land they occupy should be protected by the government. “The biggest problem is that Indonesia does not have a clear definition of who its indigenous people are,” said Abdon Nababan, secretary-general of the Indigenous Peoples' Alliance of the Archipelago. Indonesia has about 500 ethnic groups, many of which have lived in the same area since before the nation-state was established more than 60 years ago. “Parliament is now deliberating on how to implement the UNDRIP and must come up with a clear definition if it wants to make any progress here,” Abdon said.